Bob Trimble has the DNA of Beaver County weaved into every fiber of his being. Trimble, a Center Township native and resident, had a long and distinguished career in broadcast journalism. He worked for television stations throughout Michigan before joining Empire Sports in Buffalo. Trimble was a household name among sports fans in the cities where he worked. He has an infectious and outgoing personality, combined with a love and dedication for sports and those who play them. Trimble’s career in sports broadcasting took an unexpected turn when Empire Sports folded in 2005. He then decided to move he and his family back home to Center Township where he started a brand new life in a completely different field. But this is home, and the 1975 graduate of Center High School and 2004 inductee into the Center High School Hall of Fame was excited about returning to his roots. Trimble’s career in sports broadcasting was so distinguished, and had so many exciting and memorable experiences, he decided to write a book. He needed a place to convey his stories and his experiences over the years, and low and behold, “Press Pass” was born. Trimble had been tossing around the idea of writing a book for several years once his career ended in ’05. The basement of Trimble’s home is literally a memorabilia shrine to famous athletes, with jerseys, pictures, and autographs everywhere. A lot of these photos are included in his book. Again, he was faced with more adversity once he moved home when Bells Palsy struck his face. Like any Beaver Countian would, Trimble fought through it, persevered on, and always had a positive outlook on life. He wanted to get “Press Pass” written because many friends and relatives thought it would make for an interesting read. “The book focuses in on many of the people I interviewed over the years. It is my impression of them and the time we spent together. 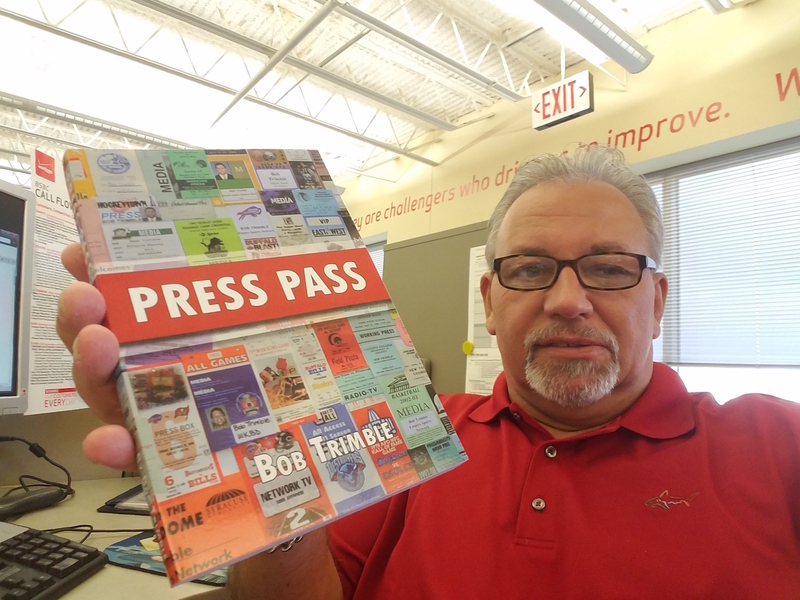 A very wide range of sports including auto racing, baseball, basketball, boxing, football, golf, hockey & tennis as well as actors, broadcasters & writers,” Trimble said when asked about what “Press Pass” is all about. When he first set out to write the book, after recovering from Bells Palsy, Trimble was struck with more adversity: a heart attack in 2012. During his recovery away from work, he said he found the peace and quiet of being alone at home during the day which opened up his memories quite vividly. Little by little, he moved from outline to actual people and his interactions with them. He finished the book over the course of four years. 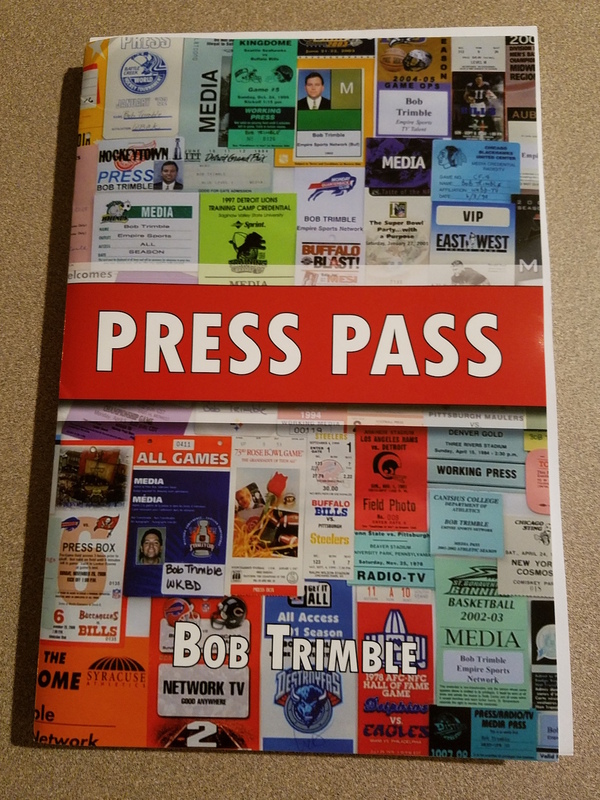 “Press Pass” is 219 pages long, with 60 photographs, and makes for an easy ready for an avid sports fans looking to gain an inside look into Bob’s world with all of these athletes and celebrities. Bob Trimble is a true success story. He’s battled health issues, the loss of his dream job, and moving several times throughout his life to where he’s at today: authoring a book that he’s always wanted to write. The cost for PA residents is $19.95 + $1.20 tax for a $21.15 total. Trimble will even cover the cost for shipping single books. If you’re interested in a copy of Bob’s book, fill out the form below and he will be in touch with you.